Monica Melissa Patterson looks on during her capital murder trial in the 370th state District Court on Thursday, Oct. 24, 2017, at the Hidalgo County Courthouse in Edinburg. Patterson is asking to be acquitted of her charges. EDINBURG — A judge has a week to rule on Monica Melissa Patterson’s motion for a new trial, after hearing arguments from her appellate attorney and the state Monday. Patterson, who was convicted of capital murder for remuneration in November, is asking to be acquitted of that charge given the lack of “legally” sufficient evidence that she killed Martin Knell Sr. in January 2015 in order to access his money and estate. The state argued throughout her six-week trial that she befriended the 96-year-old man in the wake of his wife’s death, ultimately being named executrix of his will within only a few months of meeting him. Patterson is also asking for an acquittal of her conviction of aggravated theft of more than $100,000 but less than $200,000; a dismissal of her conviction for misapplication of fiduciary funds greater than $20,000 but less than $100,000; and a reversal in her conviction for attempted theft greater than $200,000. The second and third counts relate to her tenure as director of Comfort House, a McAllen-based nonprofit hospice center. 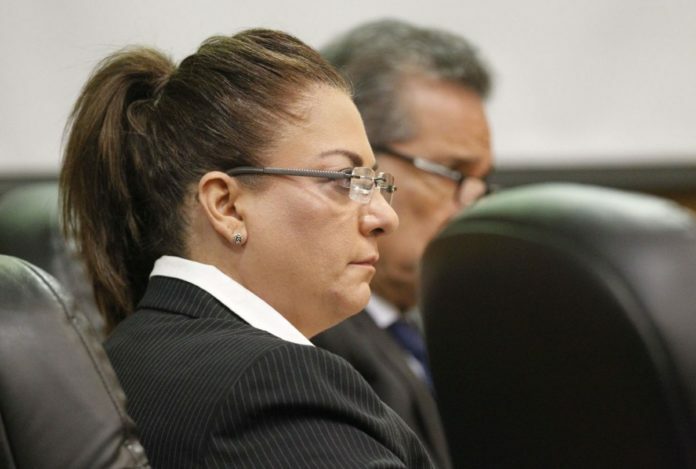 District Judge Noe González has until Jan. 16 to decide whether he will grant her requests or order a new trial for any of the four counts for which she was charged, or uphold the jury’s convictions. His ruling will determine which charges Patterson’s appellate attorney, Brandy Wingate Voss, will appeal to a higher court, the 13th Court of Appeals. Patterson is currently serving a life sentence without parole at the Hidalgo County jail, and will not be transferred to a Texas Department of Criminal Justice prison until the completion of the motion for a new trial process. She was in the courtroom Monday outfitted in an orange jumpsuit, a far cry from the blazers she previously wore before the judge. While some of the issues Voss raised during the hearing were brought forth by Patterson’s defense team during the trial — such as the judge’s allowing of a forensic pathologist’s testimony and audio recordings of a staged meeting between Patterson and the sole witness to the murder — others were unique to the motion for a new trial. “I’m saying we didn’t have to ask for it,” Voss replied. The judge, who noted that he may not agree with Voss’s view that Mascorro was an accomplice, said he would accept responsibility if the appeals court was to determine that he erred in not including it. But he also reminded the attorneys in the courtroom that judges in district courts “rely heavily on what I consider good lawyering … and on the true meaning of officers of the court. The judge noted everyone — the defense, the state and himself included — had “a lot to do” before the Jan. 16 ruling, including preparing and reading case law and reviewing six weeks’ worth of testimony from dozens of witnesses. Molly Smith covers public safety and the Hidalgo County District Courthouse for The Monitor. She can be reached at msmith@themonitor.com or (956) 683-4437.